Bhubaneswar: After over 30 years of legal battle the State Government finally took possession of a valuable piece of land of more than 1.3 acres near AG Square in the city through an eviction programme, taken up by the Central Enforcement Monitoring Committee (CEMC) starting at 6 am in the morning and continuing beyond 5 pm. Trench was also dug up around the reclaimed land to construct boundary wall immediately. It was a rare achievement for CEMC consisting General Administration Department (GAD), Bhubaneswar Development Authority (BDA), Bhubaneswar Municipal Corporation (BMC) and Bhubaneswar Smart City Limited (BSCL). This land will be used to build Bhubaneswar Museum of Urban History, which is going to be the first of its kind project in the country. During the eviction the CEMC used four Poclain machines, eight excavators, eight tippers and more than 200 personnel including police and Fire Services staff. Senior officials of GAD, BDA, BMC and BSCL were present. It can be mentioned here that the 1.3 acres of land was illegally occupied by one Raghu Ray under the guise of Indira English Medium School, since 1988. The GAD land papers were forged by the accused encroacher and the institute was also running with an affiliation of the Central Board of Secondary Education (CBSE). However, later CBSE withdrew its affiliation after the forgery came to the public eye and substantiated in the court. The school remained closed since 2007 onwards, though the encroachment over the Government land was continuing. The General Administration Department had filed an FIR against the encroacher Raghu Ray for having forged the papers relating to the land. Later an Odisha Public Premises (Eviction of Unauthorised Occupants, Act, 1972) OPPE case was initiated by the GAD. However, Raghu Ray challenged the notice of the OPPE case and obtained a status quo order in WPC 7941/2003 which was continuing since 2006 till date. GAD filed a miscellaneous case No2088/17 to vacate Status quo order of WPC 7941/2003. 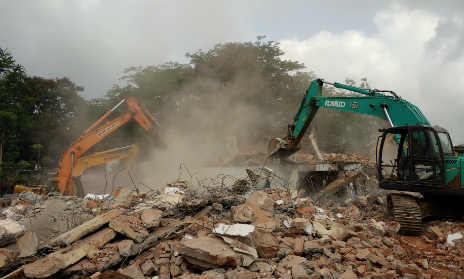 After a long legal battle the Honourable Court in WPC 7941/03 passed orders on May 5 and then on May 18 allowed time to the petitioner school till May 31 to vacate failing which, joint eviction squad of GA, BDA, BMC and the BSCL would evict the encroacher from the site on Friday. The entire land including the one grabbed by the illegal school and in total around 2.3 acres would be used for the ambitious Bhubaneswar Museum of Urban History project under the Smart City Proposal, where the visitors would have a firsthand experience of knowing the genesis of the city from an ancient fort city near Sisupalgarh to the modern State Capital, for which the master plan was done by German planner Otto Konigsberger . The city, which was also known as Ekamra Kashetra as an abode of Lord Shiva and Parvati with more than 360 beautiful monuments, later topped the Smart City Challenge and its Smart City Proposal became the best one from nearly 100 across India. Out of the entire 2.3 acres of land the unused land near Bhubaneswar Club has already been taken into possession long ago. A nearby registered youth-based organisation, Nehru Institute of Youth Affairs, would be shifted so that the land could be used for the development of the beautiful project, which would give a special identity to the city. The Bhubaneswar Museum of Urban History, once completed, would give students, young people, visitors, tourists and researchers an innovative walkthrough involving the genesis and socio-economic-anthropological evolution, to be curated and presented in a state-of –the art interactive way.